AGRICULTURE Minister Michelle O’Neill believes Northern Ireland’s beef sector “would suffer significantly” if current trade negotiations between the EU and US lead to a deal, according to internal documents obtained by The Detail. The documents also reveal concerns within her department over how to handle the issue, while other correspondence highlights poor communication within the wider Stormont government over the likely impact of the biggest EU-US trade agreement in history. The Transatlantic Trade and Investment Partnership (TTIP) is an agreement currently being negotiated by the European Union and the United States. Advocates of the agreement say it will lessen barriers to trade in terms of market access and regulatory co-operation. The trade talks have been widely criticised for their secrecy, but the Stormont tensions have emerged as First Minister Arlene Foster and deputy First Minister Martin McGuinness are in the US for St Patrick’s Day events and as Northern Ireland prepares to vote in a referendum in June on the UK’s future in Europe. Sinn Féin Minister Michelle O’Neill has publicly raised concerns over TTIP before, but her fears are spelt out in a previously unpublished letter obtained by The Detail under Freedom of Information legislation. In the correspondence to EU agriculture commissioner Phil Hogan in December 2015, Minister O’Neill expresses concerns over “cash flow and income difficulties” for beef farmers, with the minister noting that “over 70% of all farms in the North of Ireland are involved in beef farming”. The concerns over the implications of TTIP for Northern Ireland come as the industry is seeking to boost trade with the US in the wake of the BSE “mad cow disease” crisis that hit exports. In March 2014 the US lifted its EU-wide BSE ban. US inspectors are expected to visit all interested member states, including Northern Ireland, in 2016 to assess their eligibility to export. Despite the concerns within the Department of Agriculture, documents obtained from another Freedom of Information request to the government’s economic development agency, Invest NI, indicate a qualified support for potential trade opportunities in TTIP. Invest NI falls under the remit of the Department of Enterprise, Trade and Investment (DETI), a department headed up by DUP Minister Jonathan Bell. In a separate Invest NI email dated September 2014, the publicly funded arms-length body responsible for job creation, notes the opportunities and the risks that exist. The internal note reads: “Invest NI has a significant interest in TTIP, given the importance of the United States as a trading partner to Northern Ireland”. It adds: “We would welcome continued consultation. Particularly keen to input to work on pinpointing which industrial sectors stand to benefit, as well as identifying what barriers companies face when exporting to the US, and how they could be addressed under TTIP. “Given the importance of the agricultural sector to NI, it is imperative that the UK Government continue to work with the Devolved Administrations and the Commission to ensure that both the opportunities and risk are understood and managed effectively”. But elsewhere, Invest NI officials appear to question the level of communication over TTIP in the Northern Ireland government. Another more recent email by an Invest NI official in September 2015 says: “I don’t think that there is really the same awareness in NI to TTIP than other parts of the UK”. 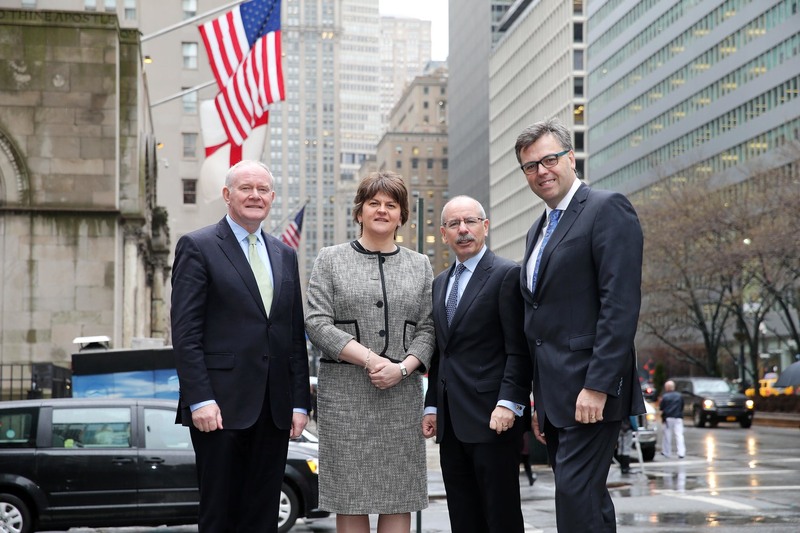 First Minister Arlene Foster and the deputy First Minister Martin McGuinness pictured with Shaun Kelly, Global Chief Operating Officer for KPMG International at their offices in Park Avenue, New York during their ongoing investment mission to the United States of America. The Office of First Minister and deputy First Minister failed to respond to our FOI request in relation to information it held on TTIP within the statutory time limit of 20 working days, but said it is still considering the request. In a statement to The Detail, Minister O’Neill said she had consistently stated concerns around the Transatlantic Trade and Investment Partnership. “The secret manner in which these negotiations have taken place remain a matter of concern to me,” she said. “New trade agreements can offer opportunities to widen our export markets, but this has to be balanced against the potential threats. The minister added: “Along with my trepidation regarding prospective negative impacts on the agri-food industry, I also have concerns about the possible detrimental impacts of TTIP on the environment, workers’ rights, consumer confidence and public services. The TTIP negotiations between the EU and the US come as the UK is preparing for a June 23 referendum on its continued role within the European Union. The Detail project, Detail Data, recently reported on EU funding to rural communities in Northern Ireland. Click here to read that investigation in full.